MeCour thermal block accommodating 3 liter plastic bottles. Purpose for designing such thermal blocks is to provide uniform temperature to reagents and media as well as to the plates that such media is transferred to. You may also be interested in this product. 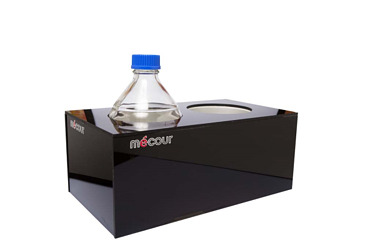 Large bottle fluid capacities are no problem for MéCour to design and produce. Round, square or conical based bottles and in single or twin capacity and with option to incorporate 2 different sized bottles. Perfect thermal units to sustain constant temperature to sensitive and valuable samples, reagents, etc. . Eliminate messy and inconsistent temp generated by submerging these bottles in ice or dry ice.